After a fine lazy day on our mooring yesterday, we were made to pay for it today. Rain had been forecast, but we had reached the end of our 48 hour time limit. We also needed the services at the Viking Afloat hirebase. 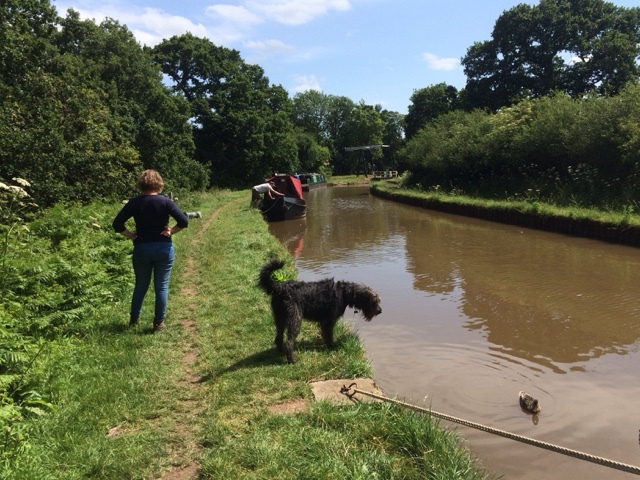 We had two options, a quick dash to get the pump out done followed by immediately mooring at the Whitchurch Arm or, continue on down the flight of locks at Grindley Brook, where we could stop for up to 14 days. Having already got wet we went for option two. We were aiming to be at this spot by Tuesday anyway, as the crew is taking a few days shore leave later in the week. There was a further benefit to stopping here, the Horse and Jockey P.H. It was lunchtime when we finished securing the boat so we popped in to see what was on offer. The food was great. Now back on the boat, all warm and snug watching an afternoon film, whilst wet bedraggled boaters are cruising by outside. 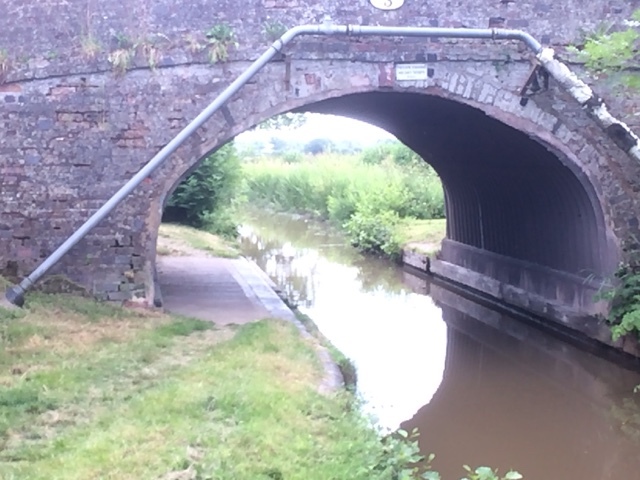 This morning we moved forward towards the Ellesmere Arm, and whilst the crew replenished supplies at the conveniently located Tesco, I filled the water tank at the CRT service yard. Knowing the starboard side of the boat was going to be inaccessible from the towpath for some time, I also gave it a quick wash down. 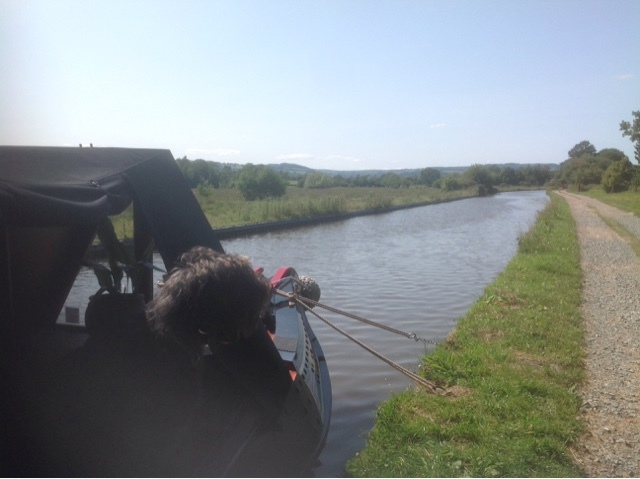 I then navigated to the end of the Ellesmere Arm and waited for the crew to finish shopping. The weather was as forecast cloudy, but with the sun breaking through in places. It quickly became apparent that today was going to be busy with boat traffic in both directions. Passing through the short Ellesmere Tunnel, the Francis Searchlight on the front of the boat illuminated its entire 87 yard length. We had a trip of 11 miles to do which is a long day for us, so we broke up the trip, taking lunch just beyond the junction with the Prees Branch. Not long after passing under the second of two lift bridges, we began to look for a mooring spot. We need to stop for two days to coincide with our arrangement to use the services at the Viking Afloat hirebase at Whitchurch on Sunday. We found a nice spot just prior to bridge 37 with clear views to the sky for the satellite, and 3G on the phone for Internet access. We are forecast some heavy weather tomorrow so we can now batten down the hatches if need be. Mooring at Duddleston Bridge 37 nr Whitchurch. 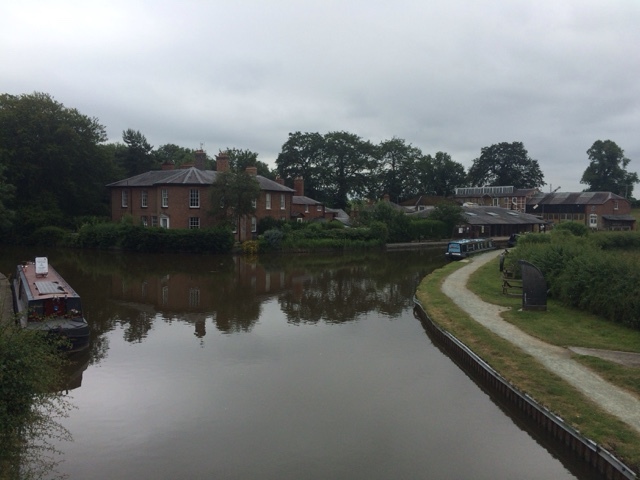 Continuing our return journey along the Llangollen Canal, today we travelled as far as Ellesmere. We had to navigate the two New Marton Locks and pass through Frankton Junction. 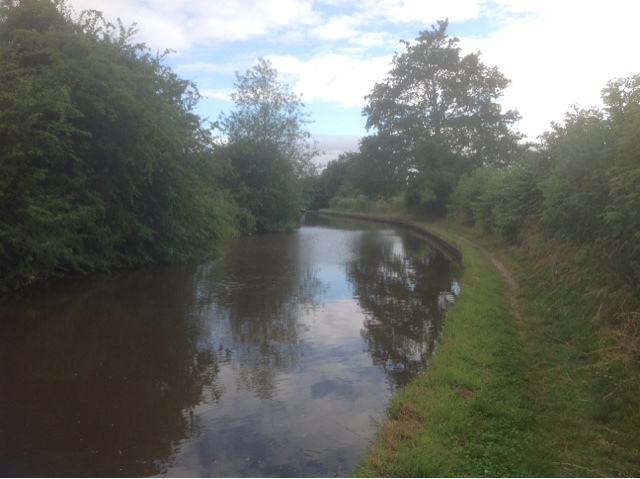 We have decided not to visit the Montgomery Canal this year due to its partial closure. On route we met an increasing number of mainly hire boats, usually at the tightest bridges and bends. Some were ok at steering and some were not, but we were able to avoid any unwanted contact. 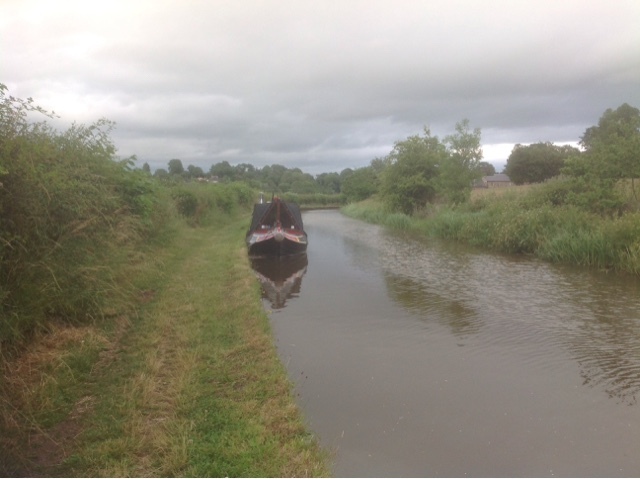 Having said that we have collected quite a few scrapes to our blacking on this canal. On arrival at Ellesmere we moored in our previous spot a couple of hundred yards from the Ellesmere Arm Junction. We will stay here a day or two, moving into the arm only to visit Tesco when we are departing. 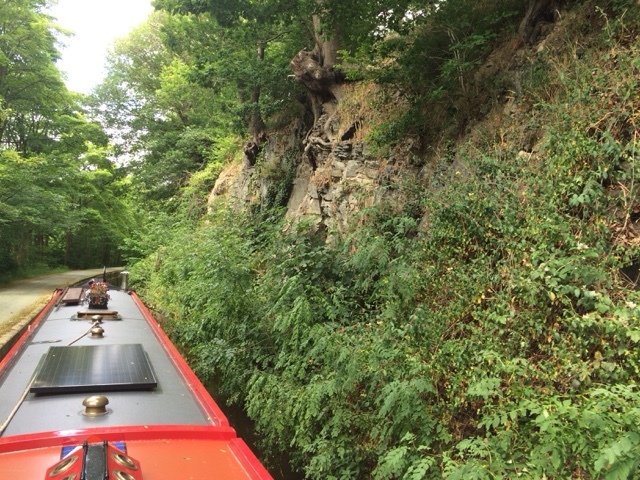 Our short time in Llangollen over, this morning we eased out of the basin and entered the narrows. Travelling with the flow made for far easier going, although we still bumped the bottom a bit. 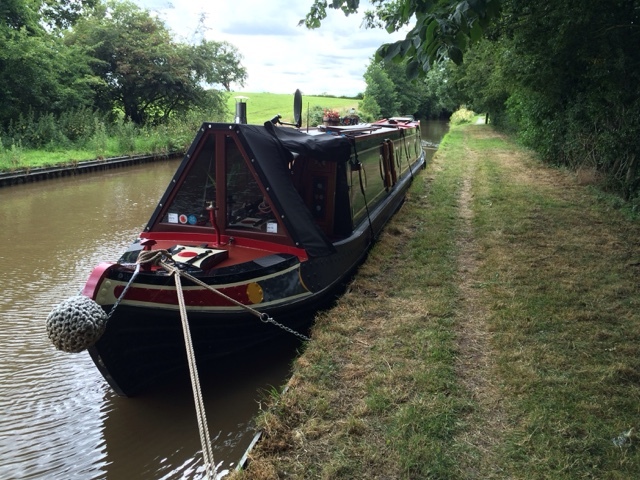 We did meet a few hire boats on route but fortunately at the wider parts of the canal. 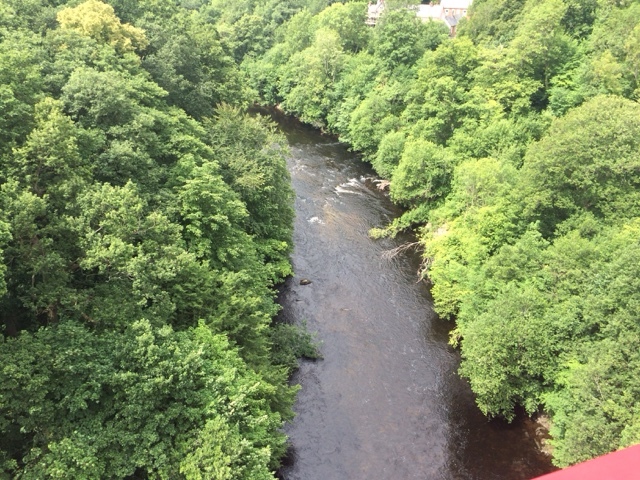 We crossed the 'stream in the sky' (Pontcysyllte) before passage through the two tunnels and then Chirk Aquaduct. As we reached the end of the Aquaduct we passed a sign saying 'Welcome to England'. Our destination was only a mile further on by the Poachers Pocket P.H. There was a free spot directly outside which we took advantage of whilst we stopped for lunch. The mooring was ok, but had the potential to be a bit noisy if the pub got busy in the evening. So after lunch we moved the boat a couple of hundred yards further on. We will probably stay here for a day or so to recuperate from our Welsh adventure. 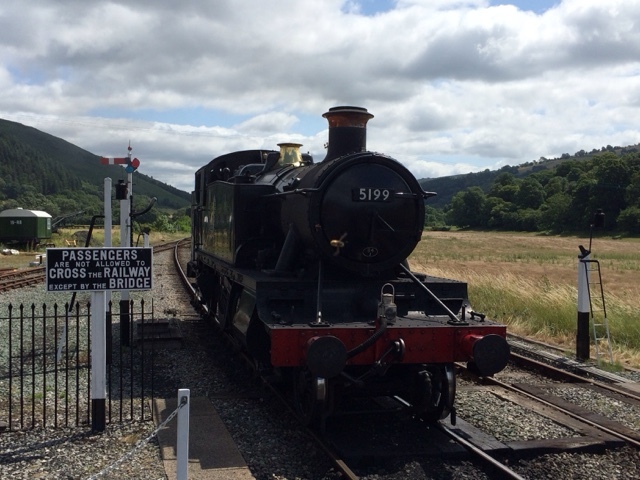 Today as planned we took a trip on the Llangollen railway. 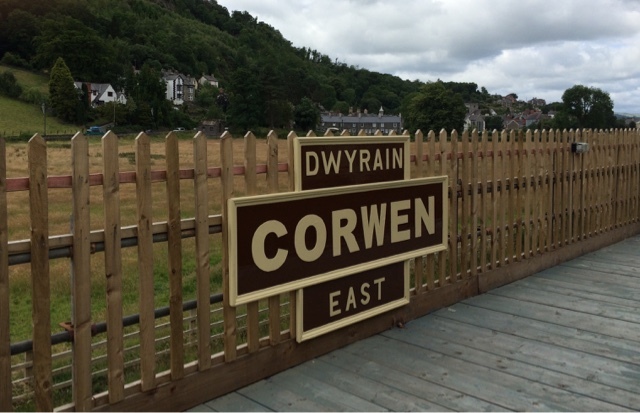 The line runs for ten miles to the village of Corwen. 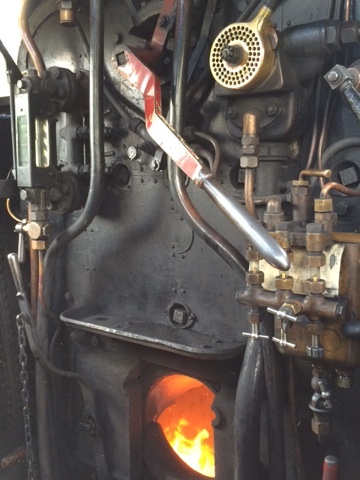 Various types of engine are used, and it is possible using the timetable to choose how you travel, either by steam or diesel. We, for obvious reasons choose steam. 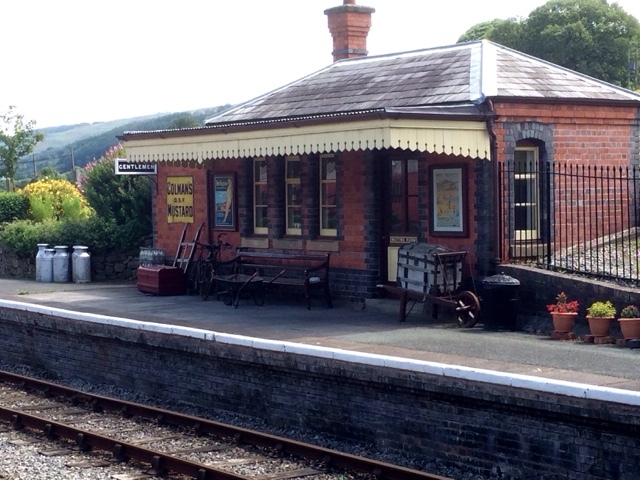 The return trip take about 1 hour 40 mins, however we opted to depart the train at the village of Carrog. Here the engine is turned from one end of the train to the other. The village also hosts the Grouse P.H. which was recommended to us by the guard for lunch, and is dog friendly. They say a picture paints a thousand words, so here they are. On approach to Carrog Station. The end of the line, currently. Engine 5199 built in 1934. 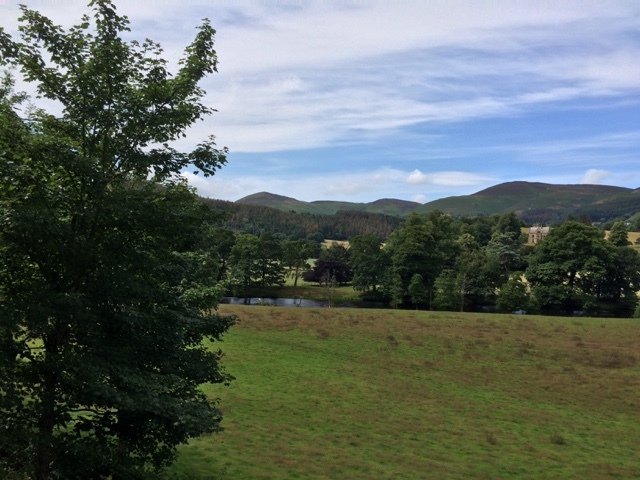 Stunning scenery surrounding the River Dee. On our return journey we disembarked the train at Berwyn. 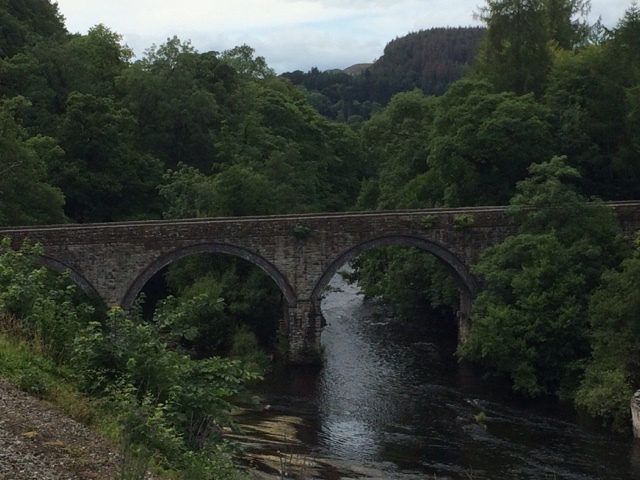 It was then just a short walk over a newly constructed chain bridge across the River Dee to Horseshoe Falls. 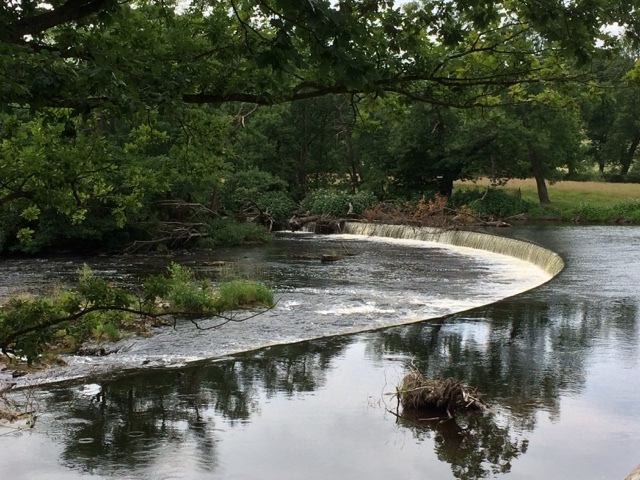 This is a Horseshoe shaped weir on the river designed by Thomas Telford to raise the river level, providing a feeder for the Llangollen Canal. The flow rate into the canal exceeds 13 million gallons a day. 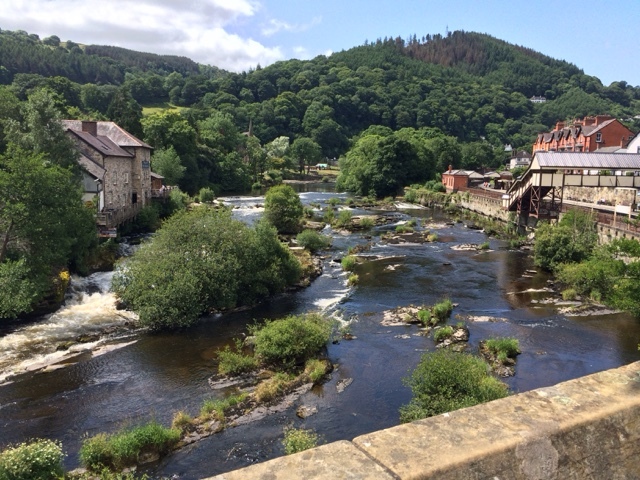 There is a strict 48 hour time limit in Llangollen Basin and our time is up tomorrow lunchtime. The weather looks fair so we are going to head back towards Chirk. This time we are going with the flow, so I expect the return journey will be easier. 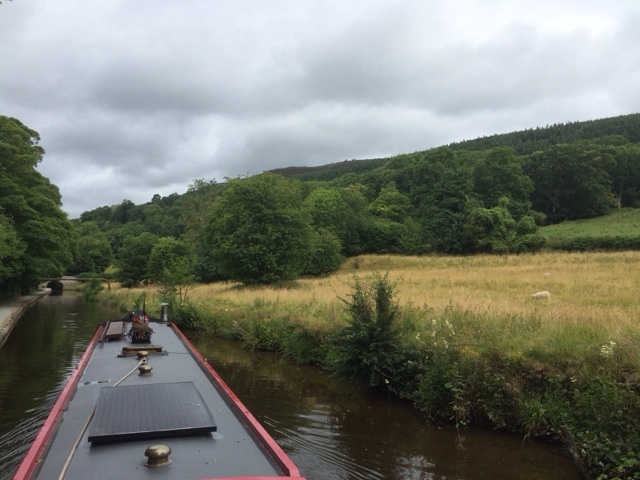 With a certain amount of trepidation, we slipped out of the Trevor arm at 8.50 this morning and commenced the turn onto the final stretch of the Llangollen Canal. The reason we were unsure how the day would go, is because the Nicholson's Guides in their navigational notes, advise against commencing this section of canal if your boat draws more than 21 inches. Our boat draws at least 30, possibly 32 inches, and I had visions of getting stuck halfway, blocking the canal at the height of the holiday season. You will be pleased to know, and we certainly are, that Nicholson's are wrong. Yes we bumped along the bottom in a couple of places and the final narrow was painfully slow, barely inching along on tickover. Other than that, not much else to report on our short, four mile incident free journey. We only met a couple of boats on the way and the basin at the end had plenty of room. So we are now all secure and plugged into mains electric for our two day stay. The Icebreaker mentioned in yesterday's post had also made it. The landscape is becoming increasingly hilly. 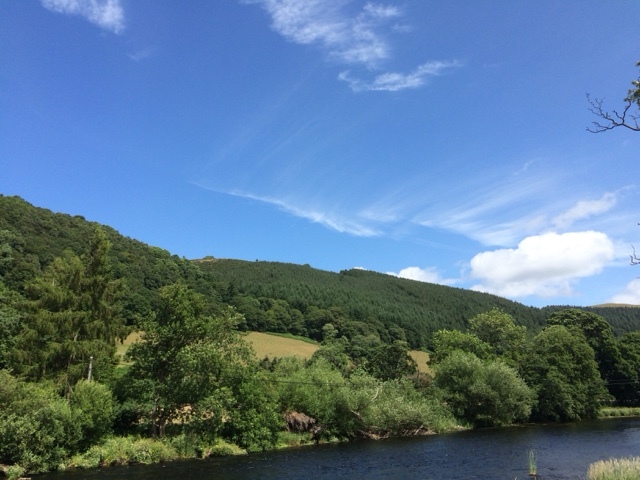 The hills above Llangollen ahead. Single passage only at this point but the water is crystal clear. 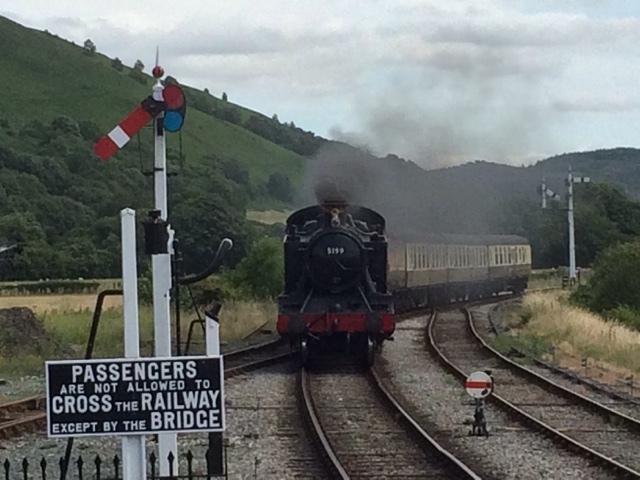 The final narrow towards Llangollen Basin. All secure in the basin. 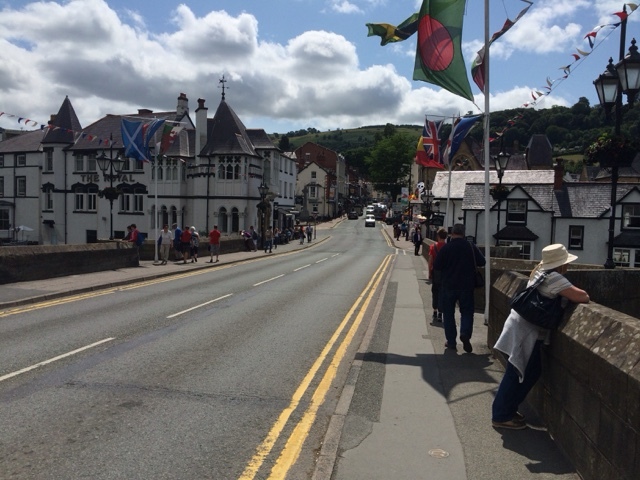 Llangollen bridge crossing the river Dee. During a walk round the town we found the railway station, and tomorrow we are in for a real treat. 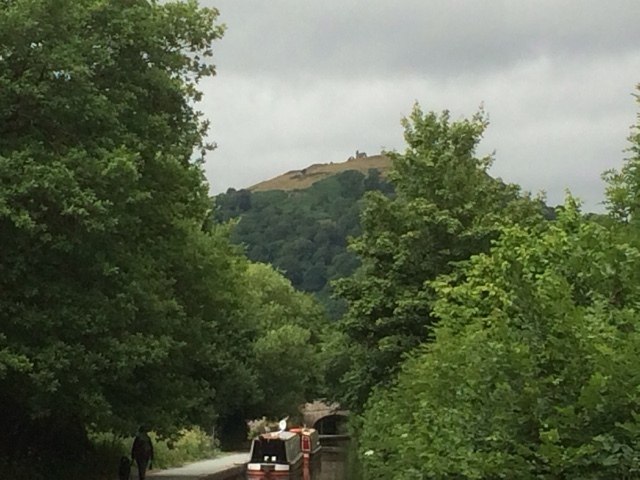 Llangollen to Corwen and back by steam train, including a trip to the famous Horseshoe Falls, the source of the Llangollen Canal. 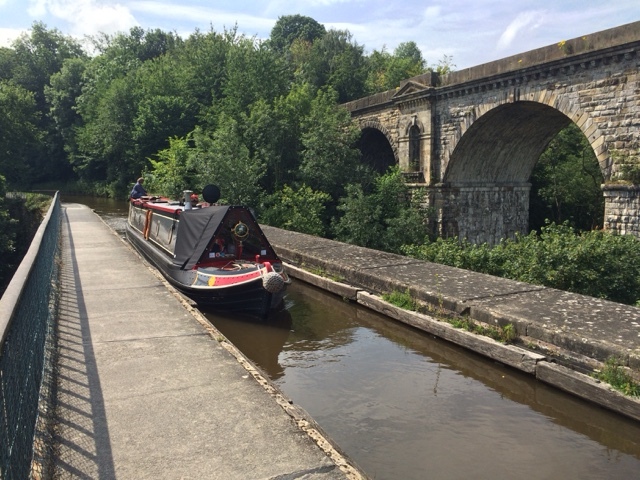 We departed St. Martins's Moor at 9.30 this morning and an hour later we were passing through Chirk, approaching the first of two aqueducts we were going to cross today. 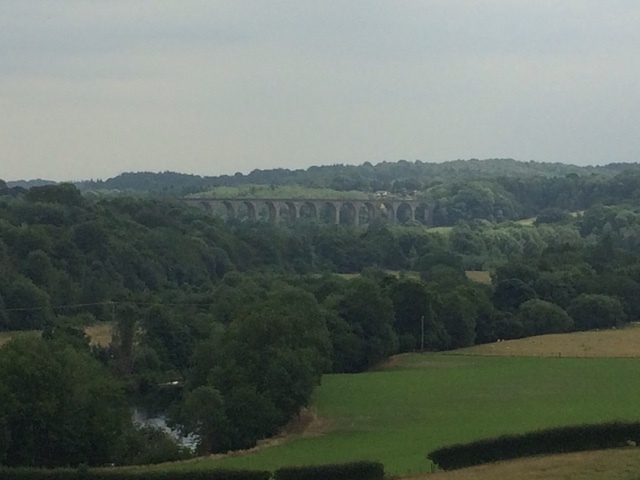 The Chirk Aquaduct is the smaller of the two but running parallel with it is an impressive structure carrying the railway. 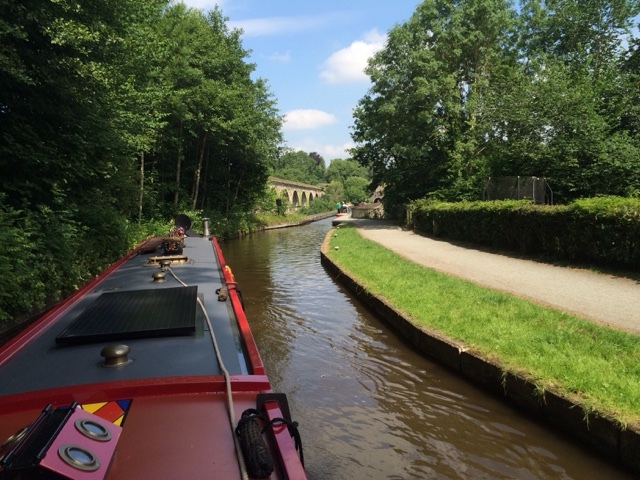 On final approach to the Chirk Aquaduct. 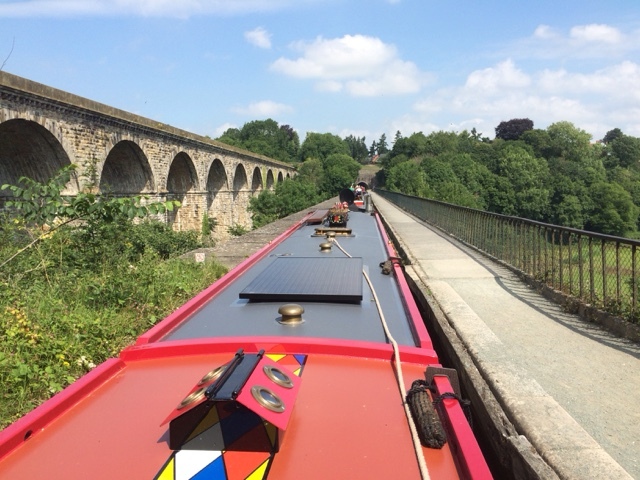 Joining the Chirk Aquaduct with the railway to the left and Chirk Tunnel ahead. The crew steering whilst I hopped off to take a few snaps. Not as high as the next one but a taste of things to come. Chirk Tunnel proved interesting. It is only 459 yards long, but due to navigating against the flow it was slow going, and 100 feet from the exit we nearly came to a complete halt. 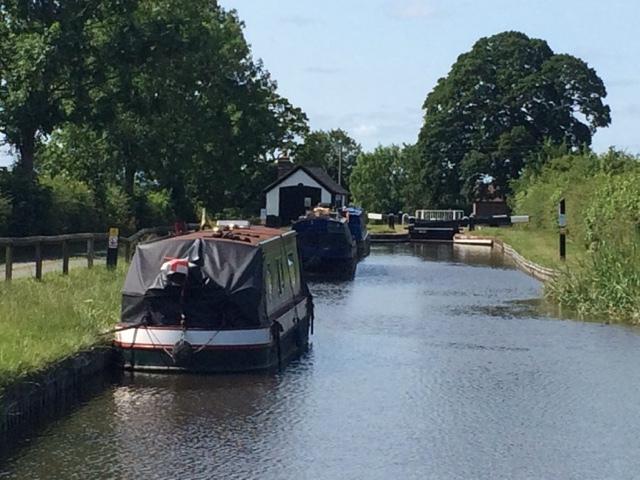 Next we passed Chirk Marina which has a big hire base. We are hoping that between 9 and 2 tomorrow most of the hire fleet will be off the system due to it being change over day when we attempt the final leg into Llangollen. The route involves navigating a few narrow single passage sections so the fewer boats to meet the better. Chirk Marina and Black Prince hire base. A few hundred yards further on is Whitehouse Tunnel. Progress was again slow but this tunnel is shorter at only 191 yards. It was then only a mile to go until the highlight of the day. The canal was very shallow in places, and we often found ourselves bouncing along the bottom. Rounding the bend at the village of Froncysyllte, we could see through gaps in the trees the Vale of Llangollen, and the height of the canal from the valley floor below. Joining the Pontcysyllte Aquaduct it seemed as if the wind picked up. The boat was being blown against the thin side of the cast iron trough, and that was all that was preventing a big drop. (Perhaps it was my bad steering). 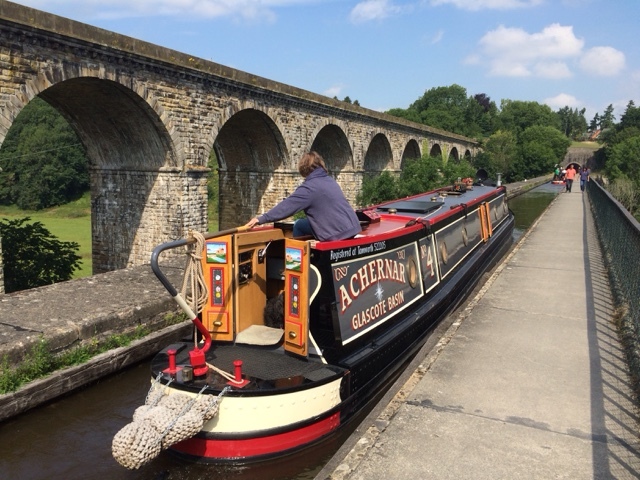 Beginning the transit of the Pontcysyllte Aquaduct. 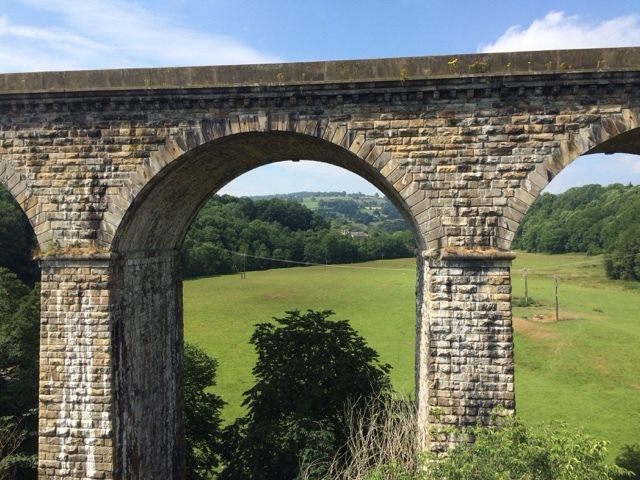 Viewing down the Vale of Llangollen with railway viaduct in the distance. Viewing up the valley towards Llangollen. Looking over the edge to the river Dee below. 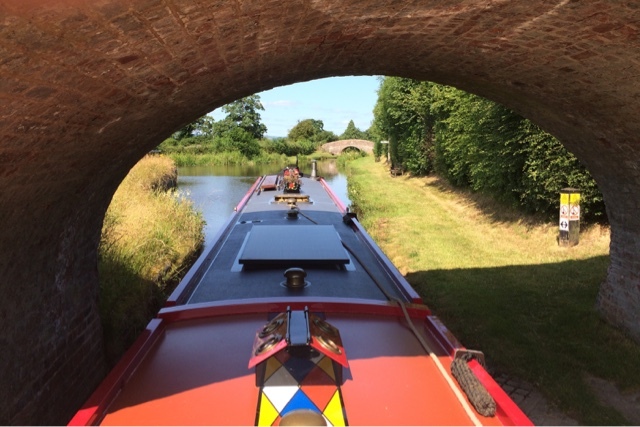 Once over the aquaduct we entered the short arm for the village of Trevor and after winding and reversing we secured ourselves at the end of the arm. 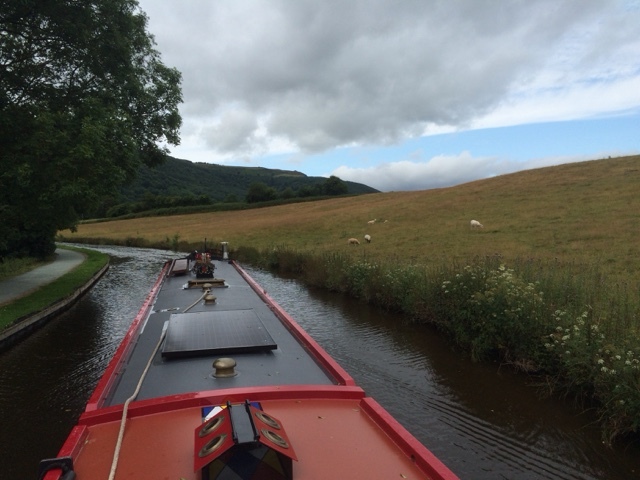 Over the last few days we have been trying to decide whether to take the boat the final leg to Llangollen as the canal is even more shallow and we have quite a deep draught. After seeking advice from various people we have decided to go for it. Moored close to us is a 1940's Ice Breaker called Spitfire. They are also going to Llangollen tomorrow. These old icebreakers are quite deep so we should be ok. 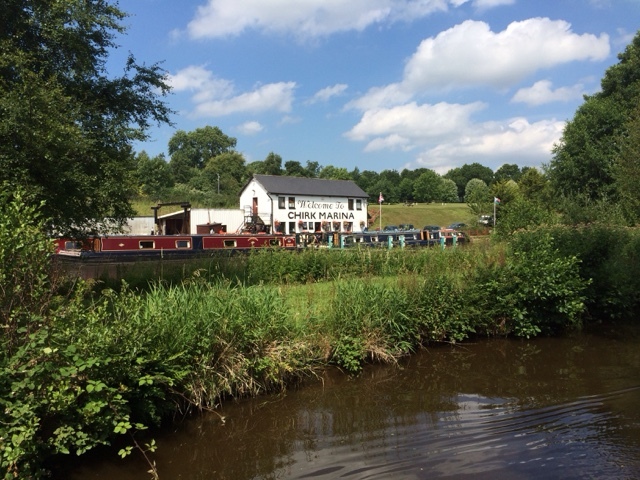 In contrast to our trip to Ellesmere, today we were treated to clear blue skies and bright sunshine. There was a slight breeze which had a chill to it but otherwise, it was perfect boating weather. We set off and maintained a steady two miles an hour. 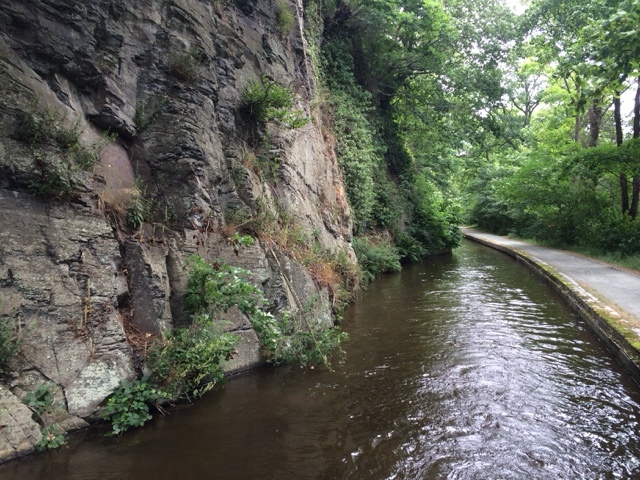 It is not possible to go much faster, due to the shallow depth of this canal. 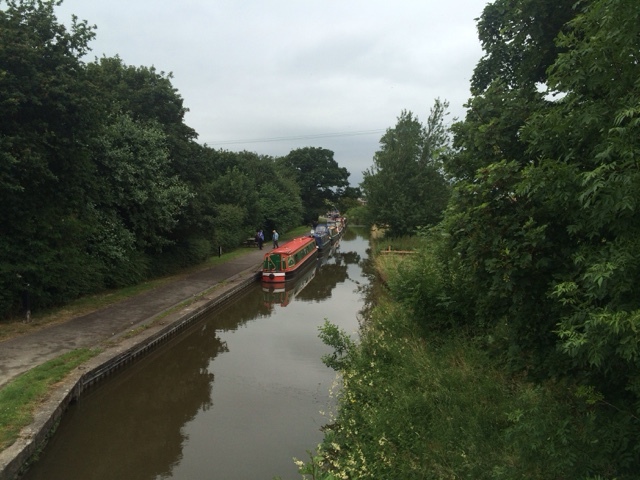 We passed through Frankton Junction where the Montgomery Canal branches off to the left. It is necessary to book passage through the Frankton locks 24 hours in advance, so we may do this on our return. Passage onto the Monty requires pre booking. 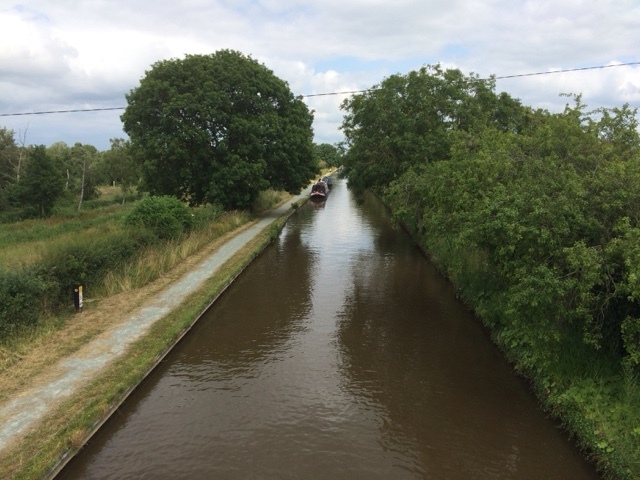 We may not have time for the Monty on this trip, however there is a breach in the canal, so the last two miles of its six mile length can't be done due to a stoppage. We have also been warned that the horse flies down the Monty, have fangs and wear hobnail boots. So if we do put it off this year, it is another good reason to come back this way again. On arrival at Maestermyn boatyard we stopped for services. The pump out was the most expensive we have paid at £18, but needs must. 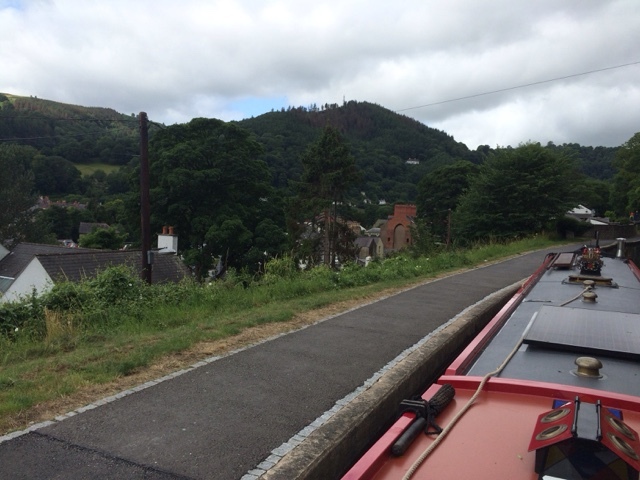 Shortly after departing the boatyard we arrived at the final two locks on the Llangollen. 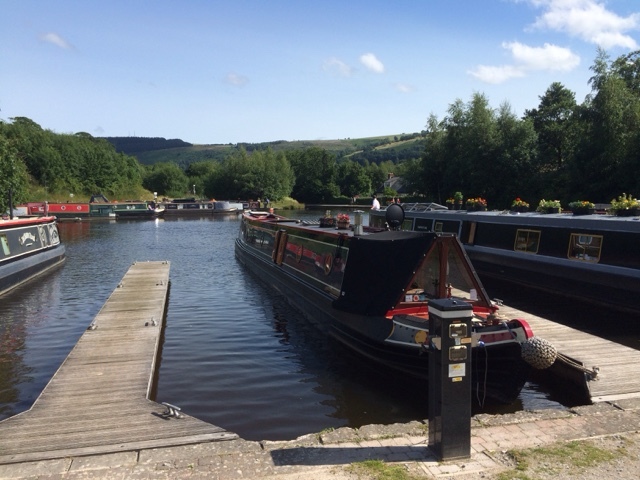 The boat traffic was heavy heading away from Llangollen, so both locks were set in our favour and we whistled through. Unlike the people coming the other way who had been enduring a two hour wait in the queue. Our mooring spot at St. Martin's Moor. 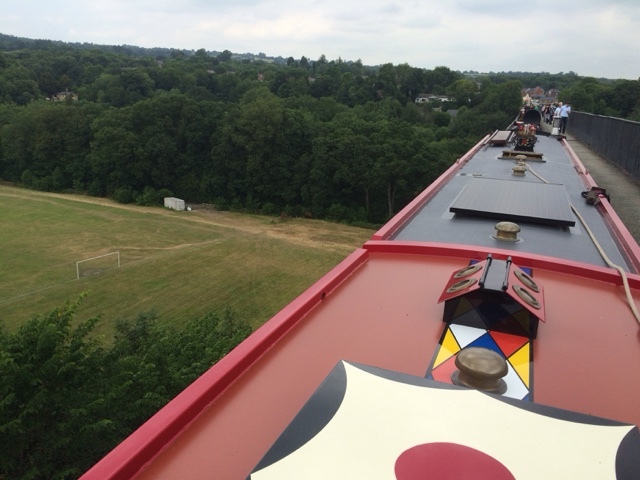 Our mooring spot is about half a mile above the top lock, so we were soon secured and having lunch. We are still in England but only just. Tomorrow within half an hour of setting off we will have crossed into Wales. The day ended as gloriously as it started with clear skies and the sun setting behind the hills on the horizon. It appears we are in for a similarly fine day tomorrow, which bodes well for our crossing of the famous Pontcysyllte Aquaduct over the river Dee, 126 feet below. As of yesterday we can no longer be referred to as fair weather boaters. 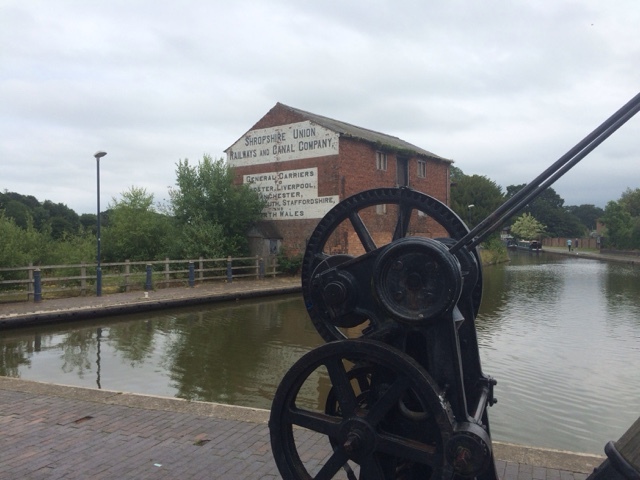 We had made the decision to travel as far as Ellesmere the night before. On waking the sky was cloudy and the ground wet from the overnight rain. We decided to stick with our plan. So after breakfast the boat was made ready, no sooner had we untied the ropes it began to rain. Fortunately it was fairly light and there was no wind, so it was not unbearable. During the journey we briefly crossed into Wales, before returning to England as the canal meanders through the countryside. Ellesmere is a small market town, surrounded by 'Meres' which are glacial lakes. On the approach some are hidden from view by thick woodland, but as we passed Blakes Mere the canal was only a few feet from the waters edge. We travelled beyond the visitor moorings which were all full, before arriving at the junction. There is a short arm that branches off towards the town centre. We carried on past the canal and river trust yard and found a semi rural spot half a mile from the town. Canal junction at Ellesmere. 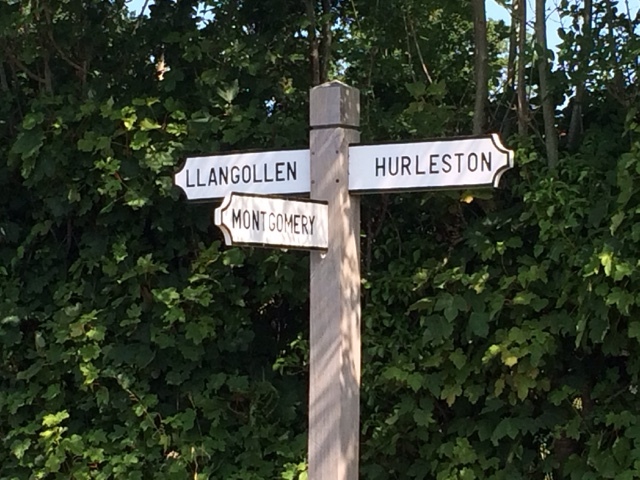 Right towards Llangollen. Bottom towards town centre. If you had not guessed already, just as we finished tightening the ropes at our mooring spot the rain stopped and the cloud started to break. 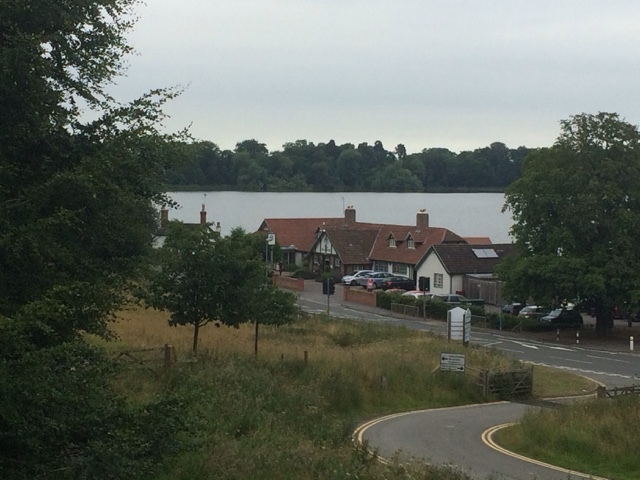 Views of 'the mere' on the edge of Ellesmere. We took a circular route back to the boat which took us via the town centre and wharf area. There is a mid sized tesco supermarket located here, which makes for easy loading of the groceries, something we may need on our return in a week or so. 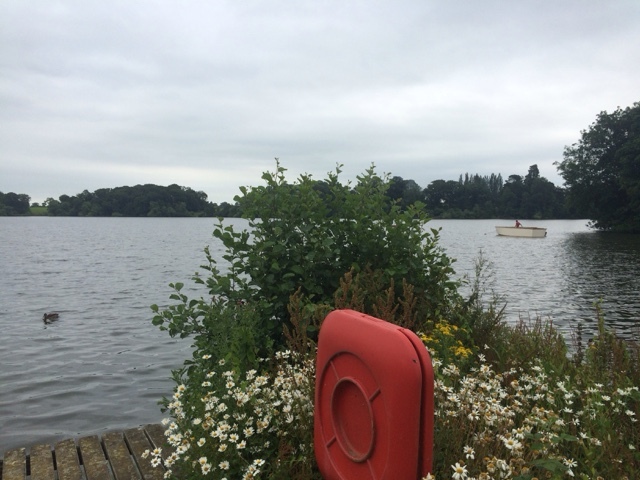 The end of the Ellesmere arm. 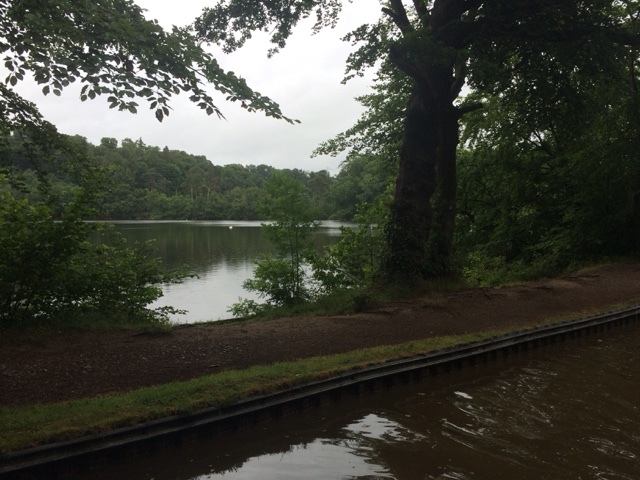 Viewing down the Ellesmere arm from the junction. There were about a dozen boats moored in the arm. All of these must move by Thursday, as notices have been placed reserving the whole arm for trading boats, that are due to arrive for a weekend floating market. We plan to depart tomorrow so will miss the hustle and bustle, and the fudge boat. Our time up at Whitchurch we needed to move today. Unusual for us as we tend not to on Sunday, preferring instead to find a roast dinner venue, not today though. Still it was fairly sunny, but not forecast to last long. The crew nipped ahead to prepare the lift bridge, this was to be the first of four bridges for the crew to raise and lower during our journey. Whitchurch lift bridge and junction. Just after the bend we stopped at the Viking Afloat hire base to top up the water and empty some rubbish. We did not need to buy anything but no charge was made for using their facilities. This impressed me as a lot of places now want to charge for water, unless you are spending money so we will try and use them for diesel or gas on our return in a couple of weeks. After passing bridge 38 the canal ran parallel with the English/Welsh border for about a mile, at one point we were only one field away from Wales, before the route of the canal and the border parted ways again. 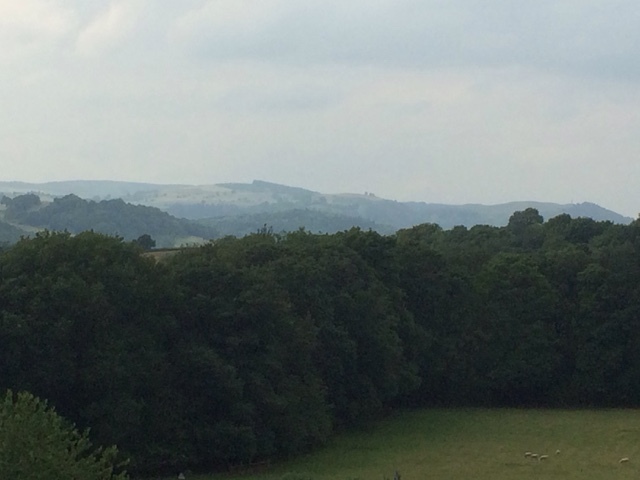 Every so often, through the trees we could see the mountainous horizon in the distance, hopefully a taste of things to come as we reach Llangollen. A couple of miles further and we reached our destination, Prees Junction. 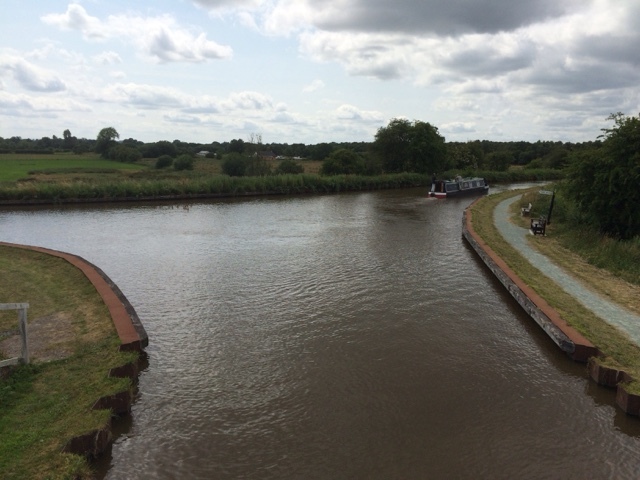 This arm of the canal is only a mile long terminating at Whixall Marina. 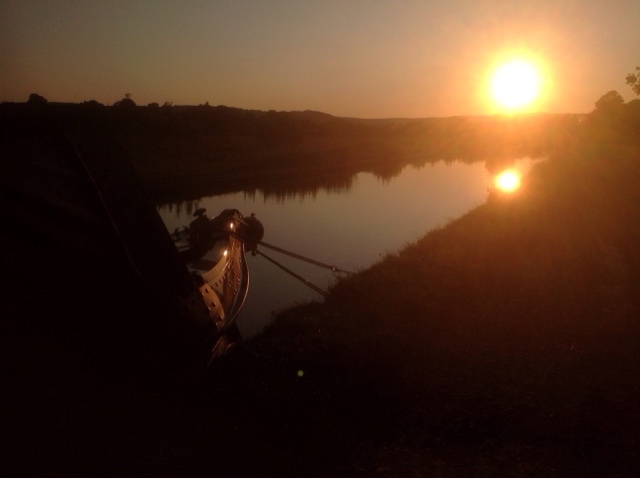 After securing the boat, we walked the length of the arm and found it to be very rural tranquil spot. 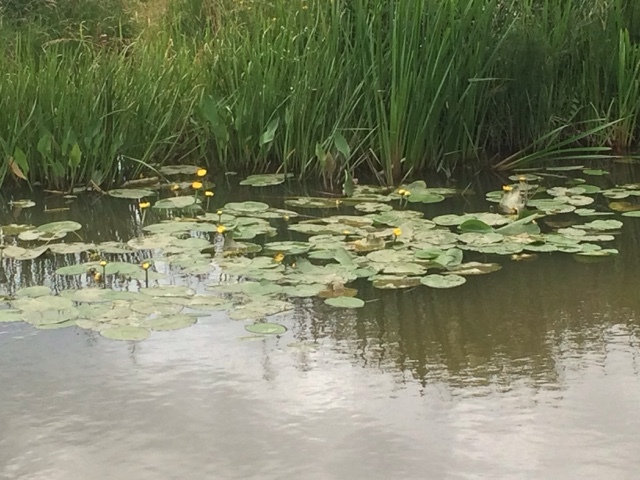 The water appeared clear and there was an abundance of flowering lily pads. Despite having a Marina at the end it appears not to be a heavily used stretch of water. Prees Junction, 200 yards ahead of our mooring spot. Lilly pads that extended almost the entire length of the arm. Looking through the final bridge. Not much passing room towards the end. Returning to the boat the sun finally disappeared and it is now overcast and muggy. The Llangollen canal has a lot of hire bases on it, and this is evident by the amount of hire boat traffic which we are seeing. I think this will only increase now as we near the school holiday season. We only plan on staying here overnight, then subject as always to the weather we will head off tomorrow towards Ellesmere. 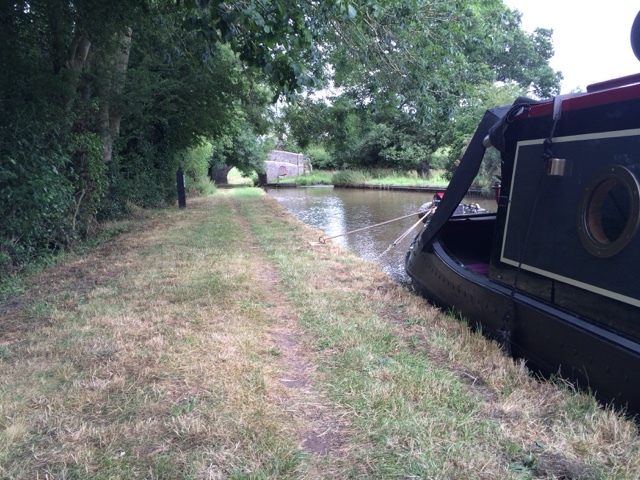 Our mooring spot at Whixall. We were enjoying our spot below Grindley Brook locks, however this morning after breakfast, the water tank gauge indicated that soon we would have just air in the tank. All three water points were above the locks so off we went. Typically, for a staircase lock it was busy and we had to wait, but the weather was great. 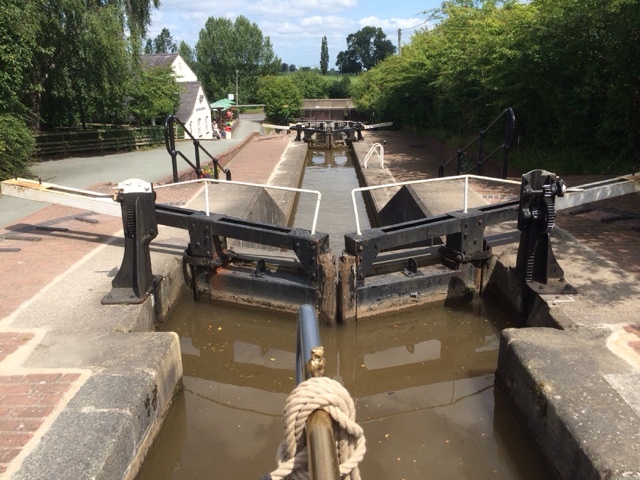 Grindley Brook locks consist of three separate locks close together, then a staircase of three. 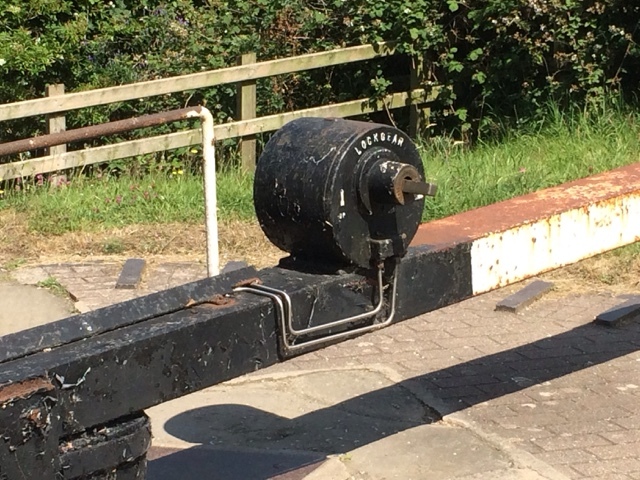 One of the single locks has hydraulic gear to raise and lower the paddles. The crew informed me, that it was much easier to turn the windlass, but it required many more rotations to fully operate. The staircase section was controlled by a lockeeper who managed the flow of boats. Three up, three down. 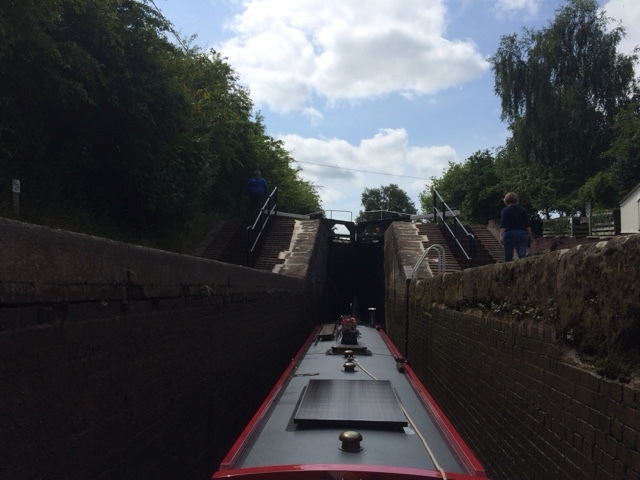 As we moved into the centre lock of the staircase I could feel some resistance, and sure enough two thirds of the way in we came to a complete halt, grounded on the cill. The lockie let some more water down to resolve this and the rest of the flight was event free. Bottom of the staircase locks. Looking back at the middle chamber where we briefly grounded. We filled the water tank at the services and had lunch before continuing on to Whitchurch. 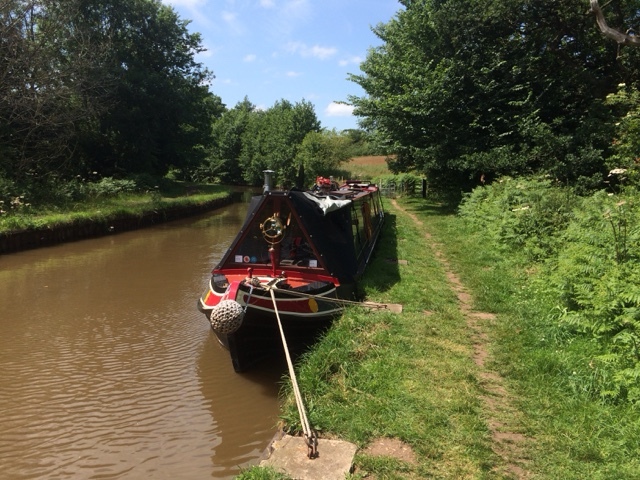 We opted to moor on the visitor moorings just prior to the short canal arm that leads into the town. The arm is only a couple of hundred yards long, but there are plans to restore the remnants of the arm and the basin which can still be seen. This would get boats closer in to the town centre which is currently one and half miles away. The afternoon was spent in the sun watching the fun and games taking place before our eyes. 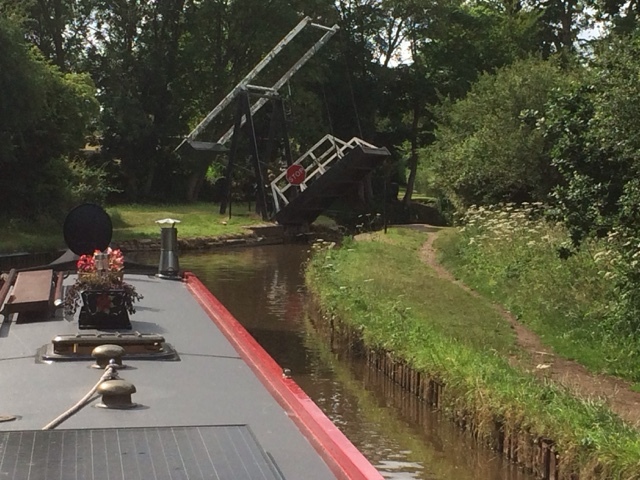 The mooring is on a blind bend with a lift bridge in the foreground. You would therefore think, boats approaching would slow down. Well you would be wrong, and we have seen several boats, mainly hire boats it has to be said, playing boat skittles. It makes quite a noise when two 20 ton boats collide. Fortunately we have been missed so far, although the boat moored ahead of us has not been so lucky. We plan on staying here the full 48 hours allowed so will probably look to move off on Sunday heading for Ellesmere.